Best for merchants selling digital goods (aka e-goods) like software, music, contents, etc. — with immediate electronic delivery. Merchants trading overseas will find it very useful, too. This service identifies online fraud using sophisticated checking algorithm and reduces chargebacks. 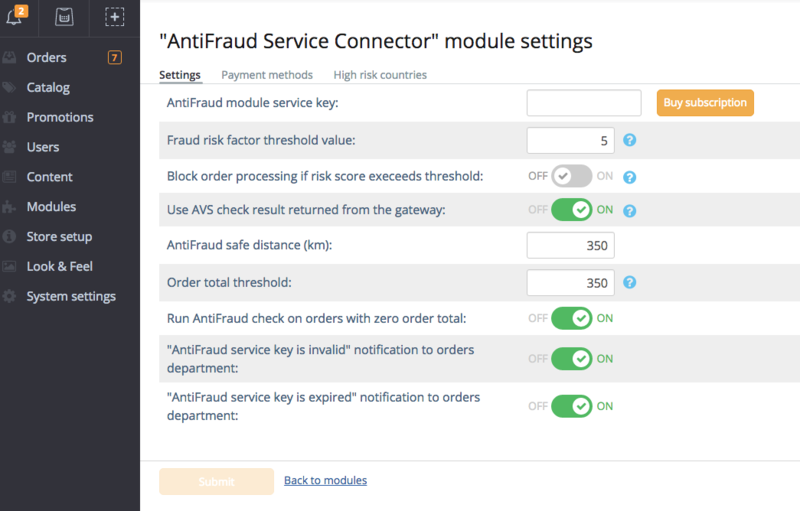 When AntiFraud screening is enabled, X-Cart submits non-personal data about a new order to AntiFraud service server to calculate the risk factor. If the risk factor exceeds the threshold you specified, the order is delayed for your further manual check (like a call to a buyer or asking for an additional evidence of authenticity etc. ), with the detailed report being provided, so you have a clear picture, what exactly was suspicious in that order. 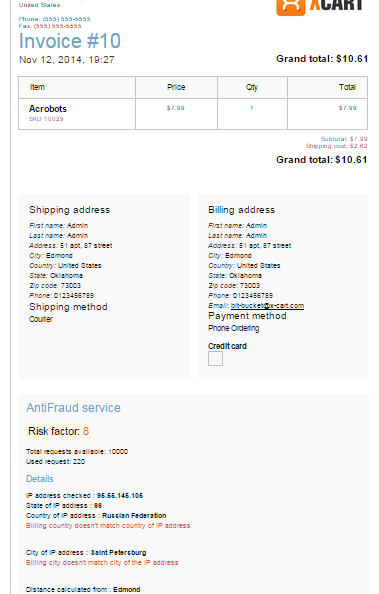 Antifraud service assesses the fraud risk factor by processing MaxMind's GeoIP/minFraud service data via our unique algorithms. The algorithms are based on our substantial experience in online credit card processing and are specially adapted to be used in X-Cart shopping cart system. Rolled out long ago, the service proved to be extremely helpful and effective for thousands of X-Cart merchants. 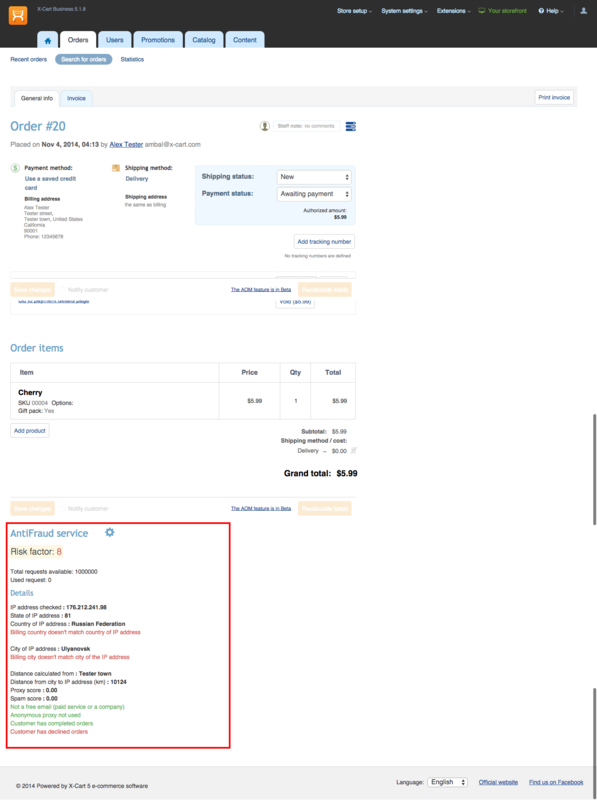 If the order risk score is too high, it can block the potentially fraudulent transaction, and keep returning the user to his checkout page, till he passes the check. And you can disable this feature if you don't like it. If the transaction is processed via X-Payments, and the payment gateway supports the Address Verification, AVS check is performed. Reducing online fraud, you save on the processing fees. Average online credit card fraud is 0.1% out of all credit card transactions. If you process over $50,000/yr in credit card payments Antifraud service can save you money. 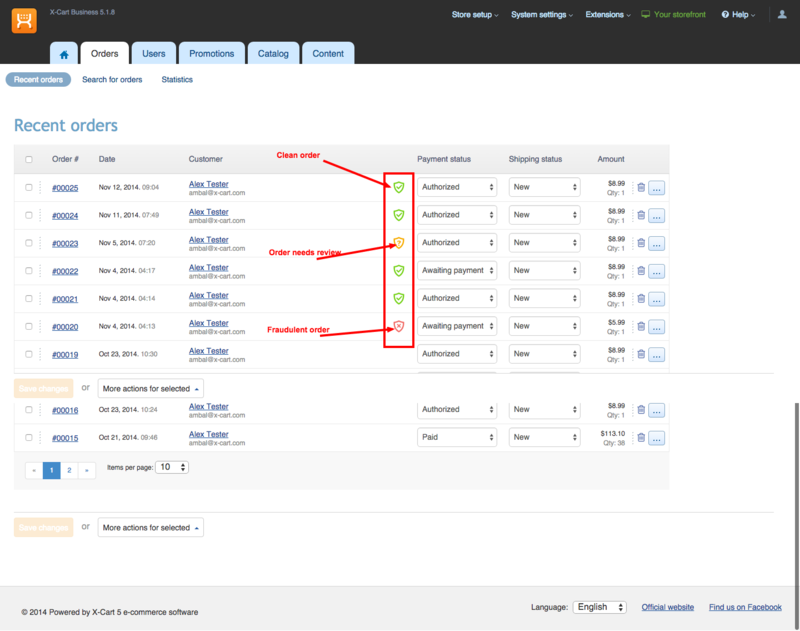 Hassle-free installation of the integration module without leaving the admin area of your store. A couple of clicks and you're all set. No setup fees. No transactions costs. Regardless of the order totals, you pay just once a year, purchasing the appropriate number of requests to the service. If the old subscription is still active, but you ran out of requests, buy a new one and get it re-filled.